Officials in Central Nigeria say the country faces "greatest threats" of cultural extinction. Butura, one of the most endangered communities in Plateau State is thought to be speedily losing its identity to western cultures. Thus, the community is introducing new laws to save the situation. 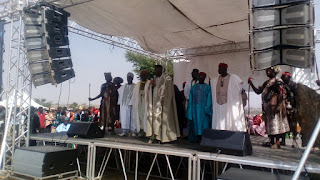 One of such is the reintroduction and reinforcement of its earlier abandoned cultural festival. "We are doing this to rekindle those values that define us as a people which are going into extinction," Engr. (Dr.) John Mallo, the Village Head of Butura said, Saturday. The community is also partnering with government agencies and independent bodies within and outside the country towards reviving its cultures, he said. "The greatest conflict in life is not knowing who you are," Mr. Mallo said at the 2019 Cultural Festival of Butura, locally called Nahwai. Butura Community which covers a wide landmass, existing since 1914 however exists under a political District. President of Butura Development Association, Mr. Philip Julson however told government officials at the festival that the upgrade was "long overdue". "We are calling on Government to release the white paper on the creation of Districts. "We wish to commend the Rescue Administration of Gov. Simon Lalong of Plateau State for discontinuing the legacy of abandoned projects. "Our District is long overdue and should be treated as abandoned projects," he said. Chairman of Bokkos Local Government Area where Butura is located also appealed to the State Government to consider the upgrade of the community's political status to a District. The Paramount Ruler of Shendam, Mr. Martins Shaldas III pledged to join in pushing for the upgrade as the representative of the Governor at the event, Mr. Sylvester Wallamko expressed confidence that his Principal would look into the request.